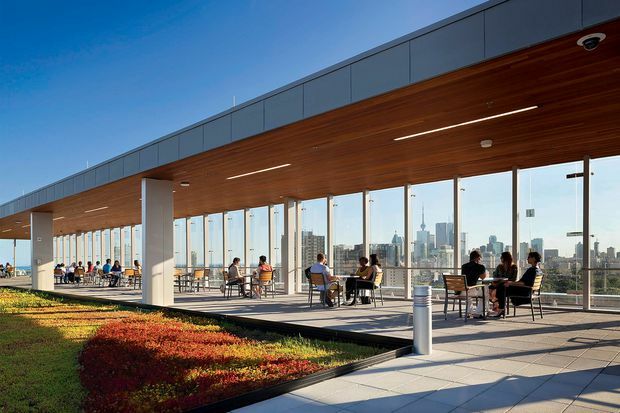 Staff on the rooftop deck at the Bridgepoint location of Sinai Health System in Toronto. The hospital manages an extensive healthy workplace program focused on the physical and emotional well-being of employees, physicians, students and volunteers. GTA’s Top Employers 2019 have a certain competitive edge. By luck or design, they’re located in Canada’s most dynamic financial and economic centre, home to more than 40 per cent of the country’s business headquarters. It’s also home to the best and the brightest who come from across Canada and the world, creating a culturally diverse work force where more than half of the region’s 6.4-million people identifies as visible minorities. That rich multicultural mix translates directly into increased innovation as diverse perspectives inspire fresh solutions for industry challenges and drive new product development. Competition for top talent in the GTA is understandably fierce, but this year’s remarkable employers lead the way with the region’s most progressive human-resources policies and initiatives. This advantage not only attracts the most talented applicants to join their ranks, but also helps to retain employees for the long term. All of these organizations offer a workplace culture that recognizes employees as individuals who want to keep growing throughout their careers. That’s why the winners make continuing support for employee education and development a cornerstone, with programs that include subsidies for professional accreditation and tuition at outside institutions, in-house training and mentoring firmly in place. They’re also Canada’s leaders when it comes to health, financial and family benefits, with many companies, such as Holland Bloorview Kids Rehabilitation Hospital, offering generous health-spending accounts and wellness programs that can be tailored to employees’ needs. While three to four weeks of starting vacation plus personal days is the norm, the most forward-looking employers take it to the next level, trusting individuals to decide their own balance between career and personal space. Toronto’s Ultimate Software Group of Canada, Inc. encourages employees to relax, recharge and pursue personal interests by providing an unlimited number of paid vacation, personal and sick days each year. You are looking at the future. Any employer with its head office or principal place of business in the Greater Toronto Area may apply for the Greater Toronto Area’s Top Employers contest. The competition is tough, as the GTA’s Top Employers is the most hotly contested of the competitions because the region is home to so many exceptional employers. Here’s how they decide the winners. The editors of Canada’s Top 100 Employers at Toronto-based Mediacorp Canada Inc. evaluate each employer’s operations and human-resources practices using the same eight criteria as the national competition of Canada’s Top 100 Employers. Those criteria are: physical workplace; work atmosphere and social; health, financial and family benefits; vacation and time off; employee communications; performance management; training and skills development; and community involvement. The criteria have remained the same since the competition’s inception. Employers are compared with other organizations in their field to determine which ones offer the most progressive and forward-thinking programs. More detailed reasons for selection, explaining why each of the winners was chosen, are published on the competition’s website, www.canadastop100.com/toronto. Accenture Inc., Toronto. Management consulting; 4,864 employees. Invests in the development of its work force, spending approximately $3,200 per person on training in the past year. AccorHotels, Toronto. Hotels; 9,688 employees. Supports families with older children through a generous academic scholarship program. ADP Canada Co., Etobicoke, Ont. Payroll; 2,112 employees. Offers referral bonuses as an incentive for employees to recruit candidates from their personal networks. AIG Insurance Company of Canada, Toronto. Insurance; 431 employees. Manages a unique paid time-off program that provides flexibility for employees to take time off for vacation, illness or personal matters. Amex Bank of Canada, Toronto. Credit card issuing; 1,555 employees. Helps employees save for the future with a defined contribution pension plan and matching RRSP contributions. Arup Canada Inc., Toronto. Engineering consulting; 284 employees. Increased its vacation policy for new employees, offering four weeks of starting vacation allowance. AstraZeneca Canada Inc., Mississauga. Pharmaceutical manufacturing; 769 employees. Encourages employees to be active in the community, offering up to three paid days off per year to volunteer. BASF Canada Inc., Mississauga. Chemical manufacturing; 799 employees. Manages a 24-month rotational professional development program for college students and recent graduates. Bayer, Mississauga. Pharmaceutical manufacturing; 1,196 employees. Redesigned its formal corporate social engagement strategy to focus on health, nutrition and innovation. Blake, Cassels & Graydon LLP, Toronto. Law firm; 1,348 employees. Launched the BrightIdeas@Blakes initiative to challenge employees across the firm to contribute ideas to improve client service or efficiency. Borden Ladner Gervais LLP, Toronto. Law firm; 1,356 employees. Offers in-house resources for new parents, including presentations and panel discussions, a new parent toolkit and a parent coaching program for lawyers. Boston Consulting Group of Canada Ltd., Toronto. Management consulting; 300 employees. Lets everyone share in the company’s success with profit sharing. CAA Club Group, Thornhill, Ont. Travel insurance and auto services; 1,624 employees. Recognizes exceptional performance and achievement through a variety of initiatives, including the Applause Program, long-service awards and President’s Award. Cadillac Fairview Corporation Ltd., Toronto. Real estate management; 1,291 employees. Offers a three-year leadership rotation program designed to provide new graduates with relevant industry experience. Campbell Company of Canada, Toronto. Food preparation and packaging; 597 employees. Increased its support for employees who are new mothers, fathers or adoptive parents with increased maternity or parental top-up payments. Canadian Credit Union Association / CCUA, Toronto. Credit unions; 77 employees. Provides retirement planning assistance and phased-in work options. Canadian Standards Association / CSA, Etobicoke, Ont. Testing, certification and related services; 754 employees. Offers onsite yoga classes and a fitness club subsidy to encourage employees to keep healthy and active. Canadian Tire Corporation Ltd., Toronto. Retail; 65,000 employees. Supports Jumpstart Charities, a nationally registered charity dedicated to removing financial barriers for children to participate in sport and physical activity. Capital One Bank (Canada Branch), North York, Ont. Credit card issuing; 1,242 employees. Organizes week-long employee appreciation celebrations each year. Catholic Children’s Aid Society of Toronto, Toronto. Child and youth services; 519 employees. Offers four weeks of vacation to start and up to eight paid personal days off, which can be used throughout the year. Ceridian HCM Inc., North York, Ont. Payroll; 1,633 employees. Offers a dedicated career exploration program to help employees learn about internal career options. Children’s Aid Society of Toronto, Toronto. Child and youth services; 792 employees. Partners with universities and colleges across Canada to provide student placements in a variety of fields. CIBC, Toronto. Banking; 36,203 employees. Celebrates exceptional performance through the Achievers program, which allows employees to send informal e-cards and nominate peers for quarterly awards. Cisco Systems Canada Co., Toronto. Computer and equipment manufacturing; 1,741 employees. Provides corporate discounts on a variety of products such as automobiles, home internet and mobile phones. Citi Canada, Mississauga. Banking; 1,198 employees. Offers generous referral bonuses as an incentive for employees to recruit candidates from their personal networks. College of Physicians and Surgeons of Ontario, The, Toronto. Professional organizations; 396 employees. Created a formal wellness program, including subsidized onsite yoga, pilates and fitness classes, newsletters, workshops and an annual onsite wellness fair. Corus Entertainment Inc., Toronto. Media production and broadcasting; 2,973 employees. Expanded its employee engagement survey to include quarterly feedback surveys addressing specific themes as well as ongoing engagement and open-ended questions. CRH Canada Group Inc., Concord, Ont. Concrete manufacturing; 1,206 employees. Helps the next generation of talent gain career-level experience through co-op placements and summer student opportunities. Diamond Schmitt Architects Inc., Toronto. Architecture; 206 employees. Encourages fun through a variety of social events, including a family picnic on Toronto Island, a paid day off to ski and snowshoe and Pi Day, an annual in-house pie tasting competition. Durham College of Applied Arts and Technology, Oshawa. College; 788 employees. Offers employees a unique opportunity to transform their vacation into a short-term leave to volunteer in developing countries. Dyson Canada Ltd., Toronto. Electrical manufacturing; 116 employees. Offers employees a number of financial perks and incentives, including signing bonuses for some employees and year-end bonuses for all. Ecclesiastical Insurance Office PLC, Toronto. Insurance; 76 employees. Makes the commute to work a little easier with subsidized parking and a generous transit subsidy of $200 a month. EllisDon Corp., Mississauga. Construction; 1,904 employees. Offers tuition subsidies for courses taken at outside institutions and access to EllisDon University, featuring a variety of courses. Enercare Inc., Markham, Ont. Electricity and HVAC services; 1,270 employees. Cultivates an ownership culture through a share-purchase plan, available to all employees. Enterprise Holdings Inc., Scarborough, Ont. Car rentals; 2,893 employees. Offers a variety of alternative working arrangements and up to eight paid personal days off. Fidelity Canada, Toronto. Portfolio management; 995 employees. Manages a unique Voice of the Employee innovation program to encourage employee feedback and awards up to $2,000 for suggestions that are implemented. Fleet Complete, Toronto. Fleet and mobile resource tracking; 265 employees. Offers a health and wellness spending account of up to $1,000, allowing employees to allocate funds for additional expenses or top up existing coverage. Ford Motor Company of Canada, Ltd., Oakville, Ont. Automobile manufacturing; 7,869 employees. Provides academic scholarships for employees with university and college-bound children. Freshbooks, Toronto. Software publishers; 263 employees. Offers a variety of social events, including an annual Porchfest cottage weekend for employees and their families, Spring Fling and a Festivus holiday party. General Electric Canada / GE, Mississauga. Diversified technology and equipment manufacturing; 6,519 employees. Offers a flexible health-benefits plan where employees can transfer unused credits to additional salary, savings or time off. George Brown College, Toronto. College; 1,454 employees. Offers employees working at the main campus subsidized access to onsite daycare when they return to work after maternity or parental leave. Griffith Foods Ltd., Toronto. Spice and extract manufacturing; 387 employees. Provides health benefits that extend to retirees, with no age limit and 100-per-cent premium coverage. Halton, Regional Municipality of, Oakville, Ont. Municipal government; 1,883 employees. Maintains a dedicated committee to provide direction and advice to meet the region’s sustainability goals. Hatch Ltd., Mississauga. Engineering; 2,901 employees. Hosts a unique Hatch Kids Camp to help families manage their time during March break. Healthcare Insurance Reciprocal of Canada / HIROC, Toronto. Insurance; 99 employees. Expanded its parental top-up program to include fathers and adoptive parents. Holland Bloorview Kids Rehabilitation Hospital, East York, Ont. Specialty hospital; 544 employees. Manages an Experienced Workforce Program to support staff during the transition to retirement. Home Depot of Canada Inc., Toronto. Retail; 13,175 employees. Maintains a charitable focus on ending youth homelessness in Canada. Hospital for Sick Children, The, Toronto. Specialty hospital; 5,852 employees. Organizes its charitable involvement and fundraising efforts through the SickKids Foundation, raising more than $10-million in the past five years. HP Canada Co., Mississauga. Computer technology and services; 485 employees. Manages a number of programs to help employees make healthy choices at home and work, including a free onsite health-screening clinic. IMAX Corp., Mississauga. Movie theatre technology; 300 employees. Encourages employees to save for the future with a defined contribution pension plan and optional participation in a low-fee group RRSP. Intact Financial Corp., Toronto. Insurance; 11,750 employees. Matches employee charitable donations and provides paid time off to volunteer, donating 6,500 volunteer hours on company time in the past year. Kinross Gold Corp., Toronto. Mining; 248 employees. Supports ongoing professional development through a number of in-house training initiatives, including Generation Gold for high-potential employees with less than two years of experience. KPMG LLP, Toronto. Accounting; 7,081 employees. Appointed its first chief mental-health officer, focused on supporting and embedding the firm’s mental-health strategy and developing a national network of mental-health champions. Kruger Products L.P., Mississauga. Paper products; 1,929 employees. Offers employees the option to extend their parental leave to an unpaid leave of absence. Labatt Brewing Company Ltd., Toronto. Breweries; 3,461 employees. Keeps employees connected through monthly town-hall-style Stein Sessions in the pub, quarterly pub gatherings for business updates and an annual National Commercial Conference. Law Society of Ontario, Toronto. Professional organizations; 528 employees. Helps employees balance work and personal commitments with a variety of alternative working arrangements and paid personal days. Loblaw Companies Ltd., Brampton, Ont. Supermarkets and grocery stores; 32,448 employees. Helps students and new grads gain relevant career-level experience with co-op placements and paid internships. Manulife, Toronto. Insurance; 12,790 employees. Provides resources and services to support the physical and mental well-being of employees as part of its Wellness Matters initiative. Maple Leaf Sports & Entertainment Partnership, Toronto. Sports and entertainment; 859 employees. Offers the MLSE Care Award for employees who make extraordinary contributions in the community. Mars Inc., Bolton, Ont. Food manufacturing; 1,454 employees. Maintains the Mars Ambassador Program to provide employees with opportunities to work on short-term assignments around the world at partner organizations. Mattamy Homes Ltd., Toronto. Real estate development; 1,336 employees. Manages a Finance Leadership Development program for recent graduates. Mazda Canada Inc., Richmond Hill, Ont. Auto wholesale; 169 employees. Offers its unique company assigned or company leased vehicle program, allowing employees to receive a new vehicle every 12,000 kilometres. McCarthy Tétrault LLP, Toronto. Law firm; 1,400 employees. Organizes extensive Employee Appreciation Week celebrations across all of its offices each year, including a healthy breakfast served by the firm’s partners. Medtronic of Canada Ltd., Brampton, Ont. Electromedical apparatus manufacturing; 629 employees. Provides generous tuition subsidies to encourage employees to continue their education, up to $6,000 for courses at outside institutions. Metrolinx, Toronto. Public transit; 3,582 employees. Encourages employees to submit ideas that result in a better workplace, improved customer satisfaction, operating efficiencies and cost savings through its Ideas@Work initiative. Michael Garron Hospital | Toronto East Hospital Network, Toronto. Hospital; 1,399 employees. Offers employees who are new parents the option to extend their parental leave into an unpaid leave of absence. Médecins Sans Frontières / Doctors Without Borders (MSF) Canada, Toronto. Medical relief organization; 265 employees. Encourages ongoing employee development through tuition subsidies for courses related and indirectly related to an employee’s current position. Nelson Education Ltd., Scarborough, Ont. Publishers; 331 employees. Offers employees paid time off during the summer months and winter holidays, in addition to vacation allowance. Olympus Canada Inc., Richmond Hill, Ont. Medical, industrial and imaging equipment; 250 employees. Offers a health-spending account as part of its health-benefits plan, allowing employees to top up coverage according to personal needs. Ontario Dental Association, The, Toronto. Professional organizations; 55 employees. Helps employees balance personal and professional commitments with five paid personal days off, which can be used at employees' discretion. Ontario Lottery and Gaming Corporation / OLG, Toronto. Gambling and gaming operations; 1,466 employees. Keeps employees informed through regular town halls hosted by the CEO and executive roundtables, which allow employees to interact with executives informally. Ontario Public Service/ OPS, Toronto. Provincial government; 65,136 employees. Offers employees priority placement for their children at the Queen’s Park Child Care Centre. Ontario Shores Centre for Mental Health Sciences, Whitby, Ont. Specialty hospital; 881 employees. Offers a number of onsite amenities, including a cafeteria with healthy and special-diet menus and subsidized meals, lounge spaces and a fitness facility. Ontario Telemedicine Network Inc. / OTN, Toronto. Electronic health information; 255 employees. Helps employees plan securely for the future with contributions to a defined benefit pension plan. Oracle Canada ULC, Mississauga. Computer and information management systems; 2,531 employees. Encourages employees to adopt an ownership mentality through a share-purchase plan, available to all employees. Peel District School Board, Mississauga. Schools; 15,501 employees. Works with local charities that have a direct impact on the lives of children and youth. PepsiCo Canada, Mississauga. Soft drink and food manufacturing; 10,699 employees. Offers retirement planning assistance and extends its health-benefits plan to retirees, covering 100 per cent of the premiums, with no age limit. Points, Toronto. Customer loyalty program software; 192 employees. Maintains a YOLO (You Only Live Once) leave program allowing employees with more than five years' service to apply for unpaid leaves of up to 12 weeks. Praxair Canada Inc., Mississauga. Gas and related product wholesalers; 2,270 employees. Introduced new training initiatives, including unconscious-bias training for managers and a generational differences awareness workshop. Procter & Gamble Inc., Toronto. Consumer product manufacturing; 1,657 employees. Designed head office renovations and ongoing changes with the help of employee focus groups. RioCan Real Estate Investment Trust, Toronto. Real estate investments; 655 employees. Helps cultivate the next generation of talent through summer-student roles, co-op placements and paid internships. Rogers Communications Inc., Toronto. Telecommunications, cable, publishing and subscription programming; 21,631 employees. Invests in the long-term career development of employees, providing opportunities to participate in leadership training and formal mentoring. Royal Bank of Canada, Toronto. Banking; 52,575 employees. Offers a purchased vacation option that lets employees purchase up to 20 days of additional vacation time when needed. Royal Ontario Museum / ROM, Toronto. Museum; 363 employees. Offers a full range of alternative working arrangements to help balance personal and professional commitments. RSA Canada Group, Toronto. Insurance; 2,841 employees. Offers a full suite of financial benefits, including a share-purchase plan and year-end bonuses for all employees. Ryerson University, Toronto. University; 3,216 employees. Employs a mental health co-ordinator, responsible for overseeing related initiatives across campus and creating a harmonized and holistic approach to mental well-being for faculty, students and staff. Salesforce, Toronto. Customer relationship management; 1,335 employees. Developed an in-house feedback app that encourages ongoing monthly two-way feedback between employees and managers. Samsung Electronics Canada Inc., Mississauga. Communications equipment manufacturing; 572 employees. Offers a number of in-house programs, including an annual Development Week, the “myDevelopment” career portal and a global mobility program. Schneider Electric Canada Inc., Mississauga. Industrial automation and controls; 2,614 employees. Manages a results-focused community program directed at finding ways to help people, such as building homes with Habitat for Humanity. Seneca College, Toronto. College; 1,595 employees. Maintains a dedicated Retirees Association to support continuing contact and dialogue and organize related social events. Siemens Canada Ltd., Oakville, Ont. Engineering; 3,998 employees. Maintains the Caring Hands Employee Committee, which helps the organization plan its corporate social responsibility program and activities. Sinai Health System, Toronto. Hospital; 3,496 employees. Manages an extensive healthy workplace program focused on the physical and emotional well-being of employees, physicians, students and volunteers. Spin Master Corp., Toronto. Children’s toys and entertainment; 472 employees. Offers referral bonuses as an incentive for employees to recruit candidates from their personal networks. St. Stephen’s Community House, Toronto. Social service agency; 168 employees. New parents can take advantage of onsite daycare when they are ready to return to work. Stanley Black and Decker Canada Corp., Mississauga. Tool and hardware manufacturing; 1,257 employees. Focuses its charitable efforts on supporting humanitarian, health-related, community development and environmental initiatives. State Street Canada, Toronto. Investment banking and securities dealing; 1,193 employees. Provides retirement planning assistance and phased-in work options to help retiring employees transition. Sun Life Financial Inc., Toronto. Insurance; 9,662 employees. Created a global wellness strategy focused on five key elements: programming, communication, leadership, organizational practices, assessment and ongoing evaluation. Sunnybrook Health Sciences Centre, Toronto. Hospital; 7,450 employees. Located on a campus-like setting with nearly 100 acres of ravine parkland with plenty of green space for employees to walk or ride their bikes. Tangerine Bank, North York, Ont. Banking; 1,202 employees. Offers a wellness spending account which can be used for a variety of items, including cooking classes, gym membership, sports equipment and stress-management courses. TD Bank Group, Toronto. Banking; 46,871 employees. Invests in the ongoing development of employees with generous tuition subsidies for courses related and indirectly related to their position. Teranet, Toronto. Land registration and information systems; 518 employees. Keeps employees engaged with social events and celebrations throughout the year, including a family picnic, Easter egg hunt and a bowling night. Thales Canada Inc., North York, Ont. Information systems and technology; 1,819 employees. Celebrates exceptional performance and achievement through a variety of awards, including sales, retention, innovation and long service. Thomson Reuters Canada Ltd., Toronto. Publishers; 1,397 employees. Supports a number of charitable initiatives each year and offers employees paid time off to volunteer with their favourite organization. Toronto Community Housing Corp., Toronto. Housing programs; 1,845 employees. Offers tuition subsidies for job-related courses and professional accreditation, as well as a variety of in-house and online training programs. Toronto International Film Festival Inc./ TIFF, Toronto. Motion picture promotion and film festival; 221 employees. Helps nurture the next generation of talent through co-op placements and paid internships. Toronto Transit Commission / TTC, Toronto. Public transit; 14,279 employees. Offers workshops on a variety of topics including nutrition and fitness, caloric balance, portion control, healthy eating on the go and understanding food labels. Toronto, City of, Toronto. Municipal government; 22,009 employees. Introduced combined maternity and parental leave top-ups to 75 per cent of salary for 78 weeks, as well as extending the parental leave portion for new dads and adoptive parents to 75 per cent for 63 weeks. TVO, Toronto. Television broadcasting; 375 employees. Launched a New Product Design Challenge to harness ideas across the organization. Ubisoft Canadian Studios, Toronto. Software publishers; 4,482 employees. Allows current employees to apply for temporary assignments to other Ubisoft studios worldwide for a designated period of time. Uken Studios Inc., Toronto. Game developer; 90 employees. Offers subsidized access to a shared-use fitness facility and the services of onsite health practitioners such as massage therapists, physiotherapists and chiropractors. Ultimate Software Group of Canada, Inc., Toronto. ; Software development; 181 employees. Launched an unlimited personal time-off policy to encourage employees to relax, recharge and pursue personal interests. Unilever Canada Inc., Toronto. Consumer product manufacturing; 1,080 employees. Offers a three-year Future Leaders Program to prepare new graduates for business leadership roles. United Way Greater Toronto, Toronto. Charitable organizations; 233 employees. Offers a generous IVF subsidy, up to $12,000, if needed. University Health Network, Toronto. Hospitals; 11,518 employees. Supports employee efforts to make health and wellness a priority through a variety of programs, including personalized nutrition sessions, stretch breaks and an interactive travelling Wellness Wagon. University of Toronto, Toronto. University; 9,809 employees. Maintains a Senior College Centre to provide retired academics and librarians with space to meet and discuss topics of shared interest. UTC Aerospace Systems Ltd., Oakville, Ont. Aircraft parts and equipment manufacturing; 960 employees. Manages a rotational skills-training program with streams for those early in their career, as well as for experienced high-potential employees. VISA Canada Corp., Toronto. Credit card issuing; 109 employees. Helps employees save for the future with a defined contribution pension plan and matching RRSP contributions. William Osler Health System, Brampton, Ont. Hospital; 3,306 employees. Offers the unique Sun Life Financial Osler Global Health program, which allows employees to gain experience working abroad. World Vision Canada, Mississauga. Charitable organizations; 488 employees. Offers the purchase of up to 10 additional vacation days as well as the formal Orange Day program for four more paid days off that are scheduled on holiday long weekends throughout the summer. WSP Canada Inc., Thornhill, Ont. Engineering; 7,850 employees. Helps nurture the next generation of talent through a dedicated new graduate program, co-op placements and paid internships. Xerox Canada Ltd., North York, Ont. Computer equipment manufacturing; 2,511 employees. Manages the Xerox Employee Initiated Philanthropy program to provide financial assistance to non-profit organizations where employees regularly volunteer their time. YMCA of Greater Toronto, Toronto. Individual and family services; 1,833 employees. Offers free access to the organization’s fitness facilities at its main location. York Regional Police, Aurora, Ont. Police service; 2,260 employees. Maintains a Diversity, Equity and Inclusion Bureau and offers a number of in-house training on topics such as mental readiness, transgender awareness and aboriginal cultural competency. YWCA Toronto, Toronto. Individual and family services; 197 employees. Offers four weeks of starting vacation allowance, as well as paid personal days, which can be scheduled throughout the year.